Posted on January 5, 2018 at 10:50 am. Bee on a lavender blossom by Martin Falbisoner. This groundbreaking tool developed by ISCA Technologies for fruit and nut growers uses a naturally occurring-pheromone to increase the activity of honey bees, inducing them to pollinate more flowers and preferentially in areas where the product is applied. Its timely application at the start of flowering results in more and higher quality pollination events, increasing the potential for significantly higher crop yields. Developed under grant support from U.S. Department of Agriculture, SPLAT BLOOM essentially focuses bees toward the desired crop areas. APIS BLOOM is applied directly to the crops, in the vicinity of the flowers. It then steadily releases a pheromone called Nasonov. 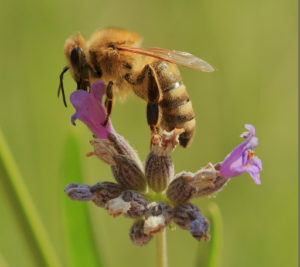 This is the same compound the worker bees release in nature to tell other bees they have discovered productive sources of pollen and nectar, and it also guides bees back to their hives. Discouraging the bees from going beyond the orchard boundaries. Encouraging bees to forage at greater distances from the hive, which provide growers with greater coverage per hive. Making bees forage and pollinate for longer periods of time. Increasing bee activity during cooler and cloudy conditions that normally stifle their activity. 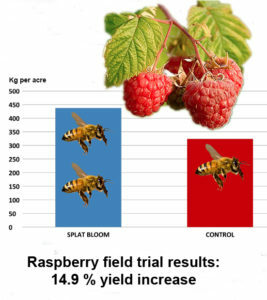 Results of trials done near Oxnard, Calif, in 2017.During test trials in 2017 at a raspberry farm near Oxnard, Calif., fields treated with APIS BLOOM had a 14.9 percent higher yield when compared to neighboring control fields that were not treated with the product. This resulted in an average increase of 175 pounds of raspberries per acre – creating a value far higher than the APIS BLOOM investment. Bees normally travel as far as two miles in their search for pollen, though they are capable of going twice that far. So, applying APIS BLOOM is a clever way to make busy bees even more efficient at pollinating fruit and nut crops at a time commercial beehive rental cost are skyrocketing. Increasing pollination costs have hit hard almond growers in California, in particular. Beehive rental fees have quadrupled in the past 15 years, with the average cost of renting a single hive during the almond blooming season reaching $188.53 in 2016. In 2001, the average cost was just $45.01, according to data from the California State Beekeepers Association. These higher rental costs are in response to higher cost for beekeepers as they wrestle with the invasive Varroa mite, a bee parasite, that has infested more than 40 percent of commercial hives in the United States. Beekeepers also still wrestle with colony collapse disorder – the yet-to-be-fully-explained phenomenon of worker bees failing to return home, leaving the queen and the developing larvae without enough resources for the colony to survive. These challenges have resulted in losses of about 30 percent of commercial bee colonies a year — about twice the expected rate — mostly during the vulnerable winter months, according to an analysis by the University of California. These challenges, however, do not mean the end of bees or the delicious produce that depends on them. Beekeepers have responded by more frequently dividing their colonies to create new ones. Still, the overall number of hives has declined as commercial bees have become more costly and difficult to raise and maintain. The result has been fewer hives available to be trucked from grove to grove, and thus much higher pollination costs for growers. APIS BLOOM is an economical way to increase bee pollination rates for bigger yields at a time when renting hives is becoming increasingly more expensive. ISCA Technologies is a biotech company based in Riverside, Calif., that develops, tests and commercializes safe, economical and environmentally-friendly integrated management solutions to crop-destroying and disease-spreading pests worldwide by exploiting pheromones and naturally-occurring compounds that influence animal behavior. For more information please contact ISCA Communications Director David Danelski at media@ISCAtech.com or (951) 686-5008.